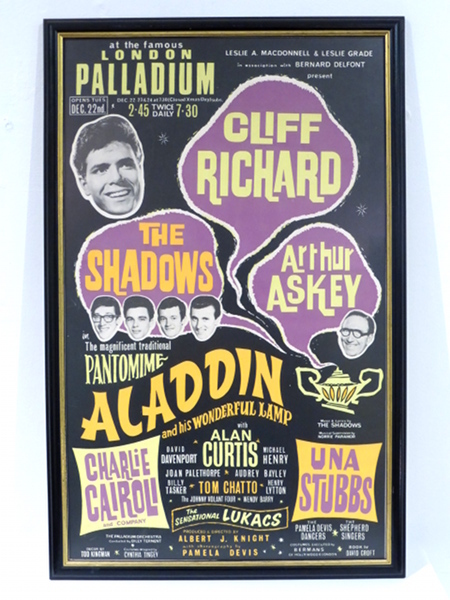 “The poster is from the 1964/65 pantomime, which ran from December 22nd to April 10th 1965. This was the longest running pantomime for many years, over 160 performances (twice daily). I am pleased to say I was one of the cast. Having worked in stage and circus over several years, I was asked by a gentleman called Johnny Hutch (Britain’s oldest acrobat) to join The Johnny Volants acrobatic team. We were the Chinese Policemen working with Charlie Cairoli. I also worked as the back of the pantomime horse with the great Arthur Askey. Cliff and the Shads were great guys, the whole cast were brilliant. This was the highlight of my career. I carried on for several years but never made it back to the Palladium. Check out the video “Paul Hayhurst – This is Your Life” in which Paul relives his career in showbiz!